Realtime Captioning Services For Events: What is CART? Live captioning services can provide those who are Deaf or Hard of Hearing with full access to presentations, lectures, or videos that they would otherwise struggle to understand. But really: every attendee at an event can benefit from captioned content! Communication Access Realtime Translation (CART) — more commonly known as Live Captioning, or Realtime Captioning — is the instant translation of spoken word into text using a specialized set of skills and equipment. The result is precise captions which can be displayed on an individual’s computer monitor, projected onto a screen, combined with a video, or otherwise transmitted for audience accessibility. Realtime Captioning service can be employed as an auxiliary aid in certain situations to ensure equal access for those with hearing loss, as guaranteed by the Americans with Disabilities Act. If a person’s preferred means of communication is sign language, captioning can be used in tandem with ASL interpreters to ensure full access for the Deaf individual. Imagine attending an all-day conference where you’re extremely interested in the topics being discussed during the presentations, but you keep missing important bits of information making it difficult to keep up with the lectures. Perhaps your mind is fatigued after several seminars, or the presenters speak very quietly, or you missed breakfast and just can’t focus. Most people have been in a situation where— for one reason or another— they were not able to follow along with a presentation. This can be a frustrating experience and, for those who are Deaf or Hard of Hearing, an unfortunately common one. Approximately 15% of American adults, or 37.5 million people aged 18 and over, are currently living with some level of hearing loss. This is a significant percentage of people who might be sitting out there in the audience, either working overtime to understand the presentation, or completely disengaged because they can’t hear a thing. 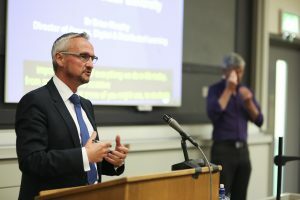 Now take into consideration the number of individuals in the audience who may have learning disabilities, cognitive disabilities, or other conditions which could limit their ability to hear or focus in a crowd. There may be audience members for whom English is a second language, or a speaker with a strong accent that makes them hard to understand. Without captioning, how many attendees are really missing the full impact of each presentation? Providing Realtime Captioning is an easy way to increase the accessibility of an event, conference, or presentation for all audience members. Studies have shown that captioning improves both comprehension and engagement, as viewers spend about 40% more time watching captioned video. Realtime Captioning is a worthwhile investment because it offers presenters the opportunity to connect with a greater portion of the audience in a more effective manner. Captioning providers are sometimes called stenographers. 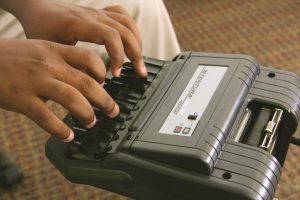 Stenographers are professionally trained to transcribe spoken language to shorthand, which is then turned into realtime text using specialized software. They strive to faithfully communicate the intention of the speaker and maintain the integrity of the message. Professional Realtime Captioning providers are certified by the National Court Reporters Association (NCRA) and bound by a code of professional conduct, which includes ethics and confidentiality. The NCRA was created in 1937 to establish a national set of standards and best practice, and they offer a variety of certifications for various settings. Knight offered to share a bit of insight into the type of training and experience that stenographers accumulate. “I spent a year and a half in court reporting school attaining a speed of 225 words per minute with 95% non-realtime accuracy, but before I started I knew I wanted to do realtime captioning exclusively, so at the same time I was using my steno machine for offline captioning at a small television captioning company and rigorously training my realtime skills as I built speed. There are two types of Realtime Captioning Service frequently used to accommodate the needs of those who are Deaf or Hard of Hearing during presentations. Projected CART: Captions are created in realtime by the provider utilizing their steno software, and the text will appear directly on the presentation screen or monitor. This requires the venue or event planner to provide a display connection and extension cord. One-to-one CART: This is best when there is only one consumer who needs captioning service, typically in a smaller venue like a classroom. The Realtime Captioning provider translates the spoken word into text and it is live streamed to the consumer’s laptop or mobile device via WiFi. 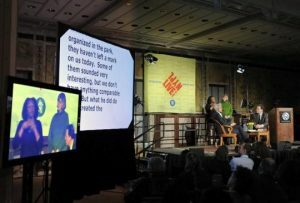 Since Realtime Captioning is such an effective way to improve communication access at conferences or events, it’s a good idea for venues and organizers to get a contract on file with a local agency that provides captioning service. Having an existing relationship with a provider makes the process of requesting services much smoother when the time comes! There are less than 650 currently NCRA certified and registered professionals working in the United States with a variety of specialties— this can put providers in short supply. Making requests for Realtime Captioning (CART) service with 14-30 days lead time, and providing the agency as much prep material as possible in advance, will help ensure coverage from a qualified stenographer. Request the start time at least 30 minutes prior to the start time of the actual presentation to allow for technical setup. On the day of service, the stenographer will arrive on site with their equipment and software and will work along with the AV team and organizers at the venue to make sure both they and the consumers are in the correct place. After services have been provided, be sure to check in with the consumers to gather feedback on the quality of captioning and be sure to contact the agency for followup if necessary! LCIS is thrilled to offer CART Services to meet the Live Captioning needs of clients in the new New York City metropolitan region and New Jersey for a wide variety or entertainment or professional events. We make the process for securing CART Services and providing equal access as simple as possible. LCIS offers quality services for Deaf and Hard of Hearing consumers with a strong emphasis on client satisfaction. Call us today at (917) 210-5804.